Answer: What you saw is called a Sun Pillar, and it’s caused by highly reflective ice crystals suspended in, or falling through, the air. Not surprisingly, they are much more common in colder weather. The photo above was captured in November 1999 from New River, AZ. If temperature and humidity conditions are just right, water vapor in the air will form flat hexagonal crystals (see inset). These crystals tend to fall with a horizontal orientation. If that seems counter-intuitive, hold a playing card horizontally and drop it, and you’ll see how well this works. A horizontal orientation allows them to reflect the sunlight, like tiny mirrors, from the recently-set Sun back to your eyes. Now, imagine billions of these crystals suspended in the air above the point where the Sun set. Their collective effect is to create a pillar of light directly above the Sun. Their color is typically that of the sunset — yellow, orange, red. 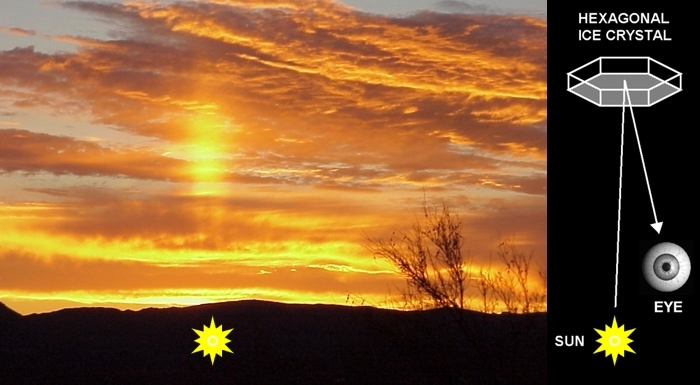 Sun pillars rarely occur in clear skies. Ice crystals are more often made in clouds, as the image clearly shows. If you look for it, you can see a similar effect in windows with mini-blinds and sometimes in screens. If there’s a bright light on the other side (Sun, Moon, porch light, flashlight) you’ll see a vertical streak of light reflected in the individual blinds. Got a flashlight? Got mini-blinds? Try this quick experiment and see for yourself.